Whenever I post photos of my little hound Toby, I get so many messages about how cute he is, and I have to agree with you! Seeing as this little one is so popular I thought I’d give you all a bit of an insight about him, how we came about getting him and what life is like caring for a four legged friend! 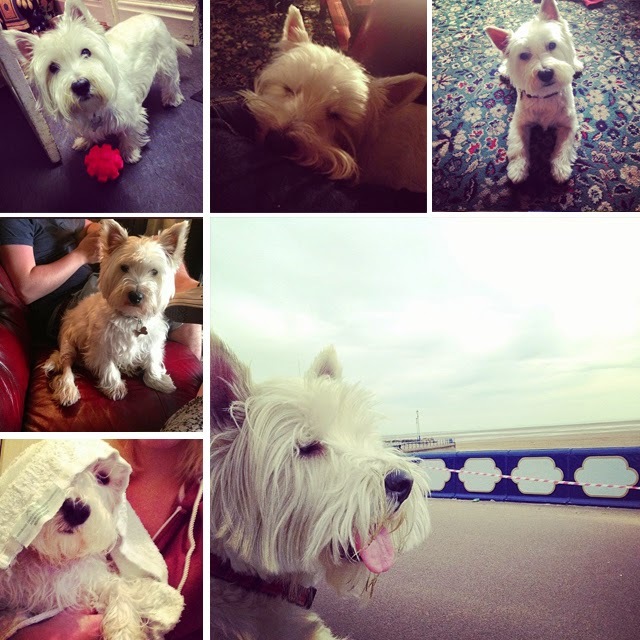 Toby is a West Highland Terrier, or Westie for short, and will be turning five next month (how time has flown!). I’ve always loved the breed and as I’m sure Dan would agree, I’ve been obsessed with the idea of owning one of my very own for a long long time. There’s something about dogs that I love, and can definitely say I’m more of a dog person that a cat lover. They just have so much character, and when cared for properly they are such lovely, friendly creatures to have around. When I decided to stay at home for university, I thought it was about time we had a look to see if there were any puppies out there that needed a loving home, so we did a bit of research and trawled the internet for somewhere local. I wanted a puppy that we could train ourselves, and with us already having an older dog at the time, we were cautious not to get one that would boss him around! Although I completely support dogs homes and the idea of adopting animals that don’t have a home, at the time it didn’t seem to right option for us. It’s definitely something I would consider in the future though, and I think the devastating fire at Manchester Dogs Home has really opened my eyes up to that. We came across Toby, who was very young (around 14 weeks if I remember rightly) and had only been with his new family for a matter of weeks, on a website called Pets4Homes. He was well and had all his jabs, and was just beginning training, however his family’s circumstances had changed since his arrival and he couldn’t be given the attention he needed, so they made the hard decision to give him up to someone else. He was only a ten minute drive away, so we quickly got in touch and made arrangements to meet him the next day. Let’s just say, it was love at first sight, and he was ours within the next week! Since that snowy January back in 2010, it’s quite honestly been a bit of a blur! Toby came into our lives and filled a hole that we didn’t even realise was empty. My mum and dad warmed to him pretty much straight away (an absolute must as we were living in the house!) and he settled in perfectly, albeit a little mischievously. Fast forward almost five years, numerous chewed pieces of furniture, dug up carpets, gnawed walls and lots of runs in the park later, and we wouldn’t have it any other way. Unfortunately when Dan and I moved in to the flat, we weren’t allowed to take Toby with us, but my mum has formed such a lovely bond with him that she was over the moon to take care of him for me. He spends his days playing with my nephews, chasing treats around the room, howling at helicopters and seeing his puppy friends on his walks, and I get to see him as often as I like. It hasn’t always been so rosey with him though, and there are things that have come along that we weren’t expecting to encounter. First off was his toilet training, which has taken an awful long time to overcome. Maybe it was the change in surroundings and disruption to his training at such a young age that caused some issues, or maybe he is just that stubborn, but we got there in the end (perseverance is key!!). Then there were the constant trips to the vets over numerous ear infections (messy, itchy and smelly, and apparently common in this breed, as well as skin infections, fyi if you’re considering one!) and worst of all the poor little thing had to go through an operation (thank goodness for the dog insurance). He’s always been a super energetic thing, but his little legs couldn’t keep up with him and unfortunately the ligament in one of his rear legs stretch and was catching on one of the bones, causing him a lot of pain. Luckily the vets were amazing and had him all fixed and better in no time. I guess what I’m trying to say, is although we love him to pieces and couldn’t imagine life without him in it, there are lots of surprises along the way that we weren’t expecting. These furry friends need bundles of love and affection and take a lot of looking after. At times we’ve had to scrape the pennies to make sure his vets bills were paid, and our insurance increased after claiming for his operation, but if we hadn’t taken it out we would have been really stuck! He’s a part of the family, a fluffy (sometimes scruffy) bundle of fun and the most loving little dog I’ve ever known (he may be five but he will always be a puppy in my eyes!). Getting him was the best decision we ever made, and I’m sure any fellow dog lovers out there would agree about their dogs! I can’t wait for winter walks in the snow, camping trips in the Spring and cuddles on the sofa with this little fellow. What would your advice be for anyone looking to get a puppy? I’d love to see some photos of your pets. Leave your links in the comments! "I&K HAIR EXTENSIONS | HAIRTRADE"
Awweeee, too cute! Excellent job getting reindeer antlers to stay on a westie long enough for a photo! 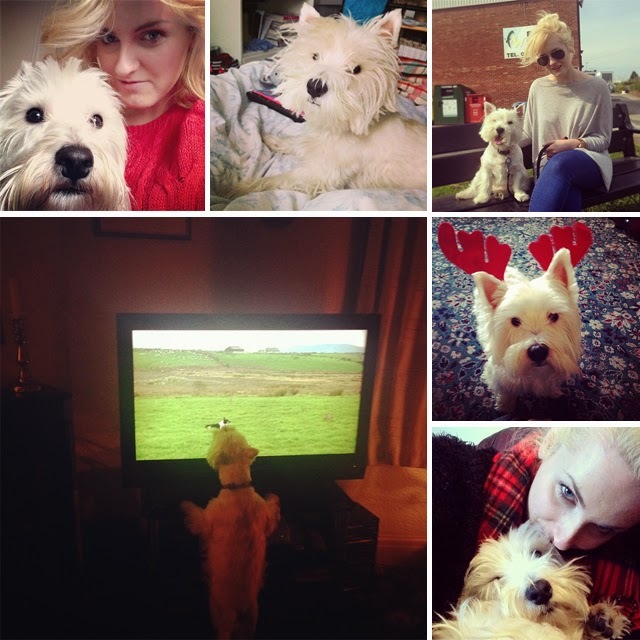 haha, I have a boy westie too (who by the way, also took ages to house train – it must be a westie thing)!